Performance proven for safe, efficient oxidation and reduction firing. A choice of standard insulating brick, low mass ceramic fiber or corrosion resistant hard ceramic lining. Forced Draft or economical natural draft. Already hundreds in use by professional ceramists, metallurgists, schools, industry and research. Standard 2500F (1370C) models in this series are rugged, time tested front loading units suitable for use in the most demanding environments. Suitable for both oxidation and reduction firing of ceramics up to 2500F. The Unique series is also used for may other applications including processing of metals and research and development projects. Using the same extra heavy gauge welded steel shells lined with high quality refractories, the three model series, USA, USF, and USN offer different fuel burner systems to meet different needs depending on requirements for economy, precision and fuel availability. For precision and firing performance USA models are equipped with a proven forced draft burner system. This system consists of precision nozzle mix burners sealed into each side of the kiln and a primary air turbo blower fan. Air and fuel are precisely metered at each burner by adjustable needle valves. Ultra-violet flame sensing and a safety shut-off valve are included to automatically shut down the system in the event of flame failure, fuel or power interruption. Optional Dual Fuel Burners available. The economical standard forced draft burner equipment supplied on the USF series consists of pre-mix burners with individual blower fans front mounted on the kiln. The controls furnished provide a means for easy manual regulation of the fuel/air mixture, heating rate, and kiln atmosphere. 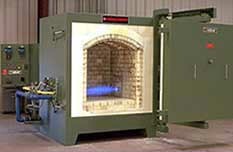 Fail safe devices are provided to shut off the kiln in the event of pilot or fuel interruption. 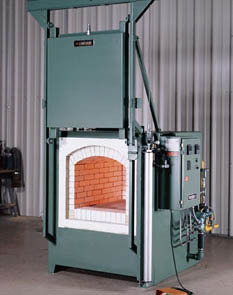 The Unique series natural draft (or atmospheric updraft) burner system does not depend on blowers but instead uses room air at existing atmospheric pressure. Burners are arranged under the kiln hearth. Each burner can be manually adjusted for control of heat distribution. Natural draft burners are simple, reliable, and provide a means of obtaining uniform gas heating at low initial cost. Safety devices are provided to automatically shut off the kiln in the event of pilot failure. Exterior – Rugged shell constructed of 1/8″ steel plate, welded and reinforced with structural steel members to form an integral unit. Door – Heat seal construction including jams and hinges fabricated of 1/8″ – 3/16″ steel with two heavy duty door clamps and covered observation ports. Electrical – System completely wired and ready for operation at 115/230 VAC, single phase, 60 Hz. Other voltages available on request. Interior – Lining consists of high quality refractories and insulation up to 8″ thick, rated to 2800F. Ceramic fiber or hard refractory lining are available options. Damper – Ceramic flue damper equipped with a manual lever. Optional Extras – Automatic microprocessor-temperature control instrumentation with thermocouple and high limit shut off. Ultra-violet flame sensing system for flame out protection. Automatic spark ignition system. for automatic temperature programming. Temperatures to 3200F (1750C).